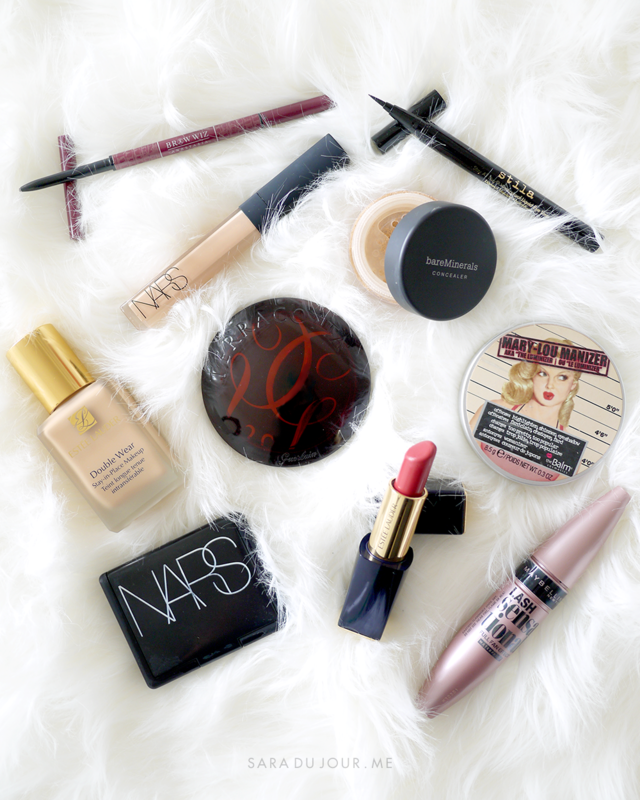 I’ve re-purchased most of these products over and over, and they’ve all reigned supreme over any competition, achieving “holy grail” status. Okay, I need to rave about this foundation for a minute. 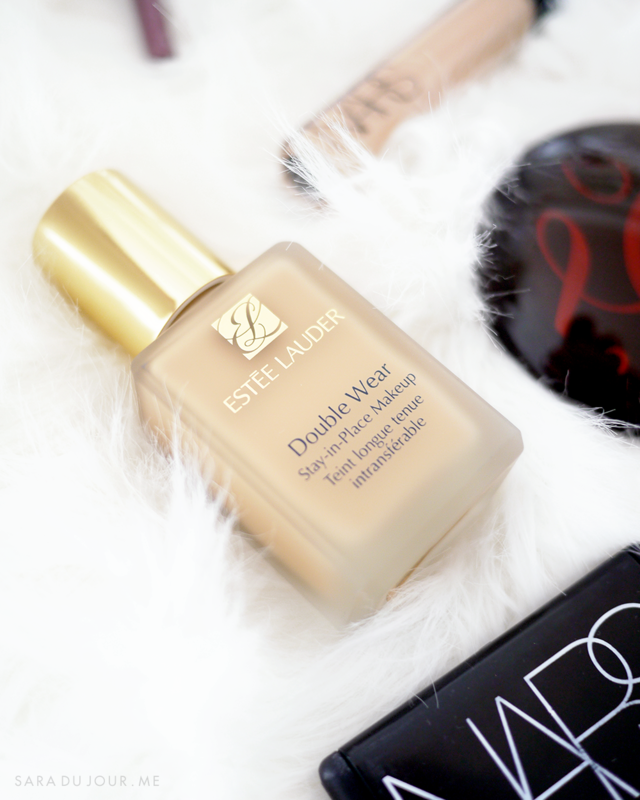 Estée Lauder Double Wear is the best there is, hands down. I don’t care if you want light coverage, full coverage, or have dry, oily, or combination skin. This. Stuff. Is. The. Best. I’ve turned more than one friend on to this product! Personally, I like a flawless, full-coverage look, and this foundation is super buildable and covers everything. Hyper-pigmentation, blemishes, everything. I don’t use a primer or have to spot-conceal with this foundation. It sets like a dream and lasts all day – I wear it at the gym because I go right after work, and it doesn’t budge even through an intense, sweaty workout. Next up, concealer. Because I have pretty serious hereditary dark circles, plus I don’t sleep, I’ve tested just about every full-coverage concealer on the market, from MAC, to Benefit, Amazing Cosmetics, theBalm, and beyond. This one’s my favourite of the heap, because of how easily it applies, and how comfortable it feels throughout the day. Often concealers with good coverage feel really heavy and drive me nuts throughout the day, but you’ll hardly notice wearing this one. 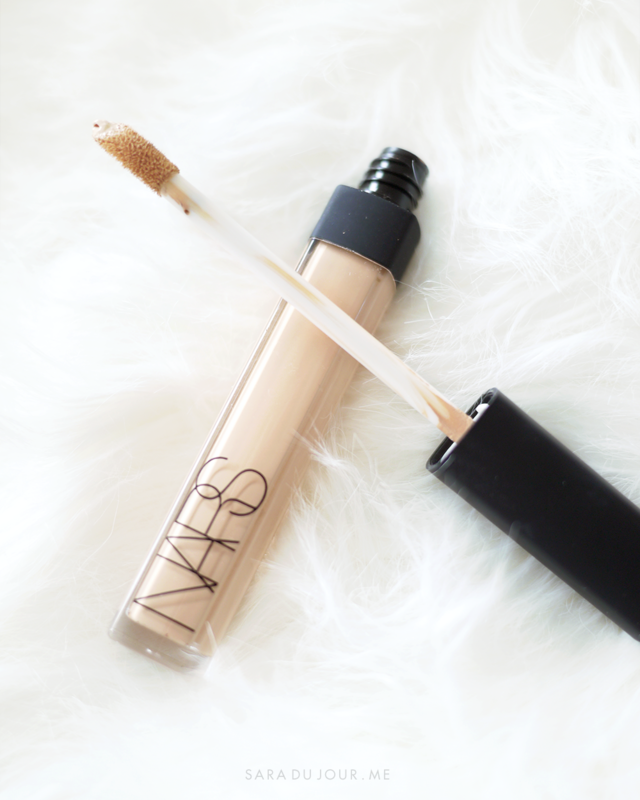 NARS Radiant Creamy Concealer comes in a wide range of skin tones and undertones, from extremely fair skin to dark skin. I use Custard, which is for light to medium complexions, and has a yellow undertone, which helps to brighten up the area. On rare occasions I can also use a bit of this to spot conceal, too. It has the subtlest bit of shimmer, which helps bounce light off the area and give it a bright, soft-focus effect. 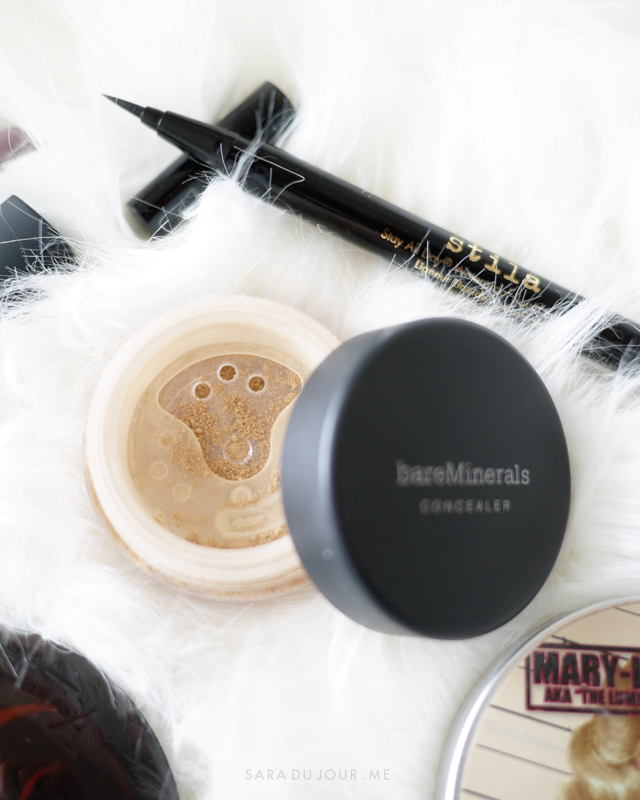 I set my NARS under-eye concealer with this product, Bare Minerals “Well Rested” concealer powder. I discovered this over two years ago, and it’s changed my dark circles game forever. It’s yellow-toned and has subtle shimmer in it, so it keeps your under-eye area bright and looks especially great in photos, because it bounces light off even the deepest-set eyes. Not only does this help to add extra brightening, but it also helps prevent your concealer from creasing or disappearing throughout the day. I think I’m onto my third or maybe fourth pot of this. If you’re fair to medium skinned, this will work for you, but I wouldn’t recommend it for deep skin tones. Onto cheeks! I contour and bronze with this Guerlain Terracotta bronzer. I was really hesitant to spend so much money on this product, because it is pricey, but I’m glad I did. I’ve been using it six days a week for close to two years, and as you can see I’ve only just hit pan – there’s still loads of product to go. That’s great value in my books! Sometimes I’ll also use this bronzer as an eyeshadow, giving my crease subtle definition and a touch of warmth. 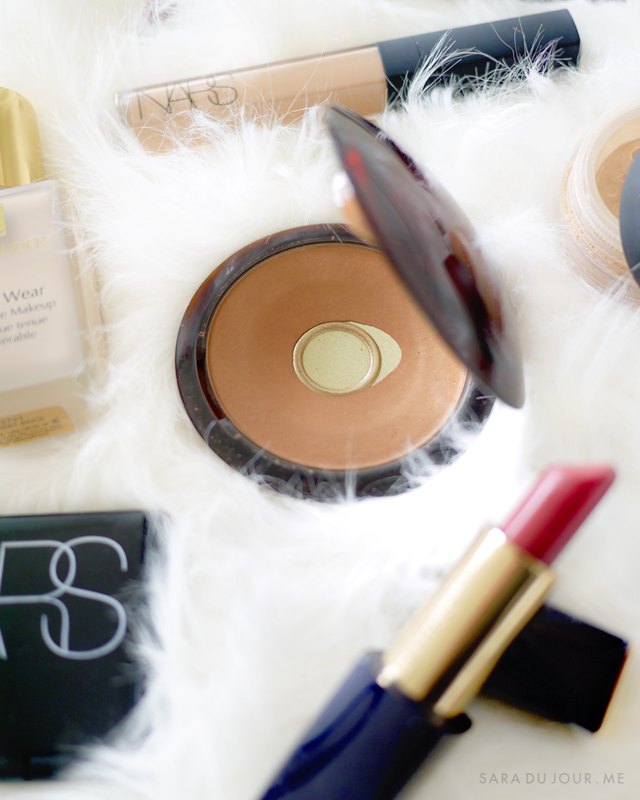 For blush, there’s really nothing better than NARS. I’ve tried several NARS blushes, and they’re all top quality. I use the shade “Amour”, because it’s a beautiful peachy pink that suits my skin tone perfectly, giving me a pretty flush but also helping to sculpt my cheekbones further. 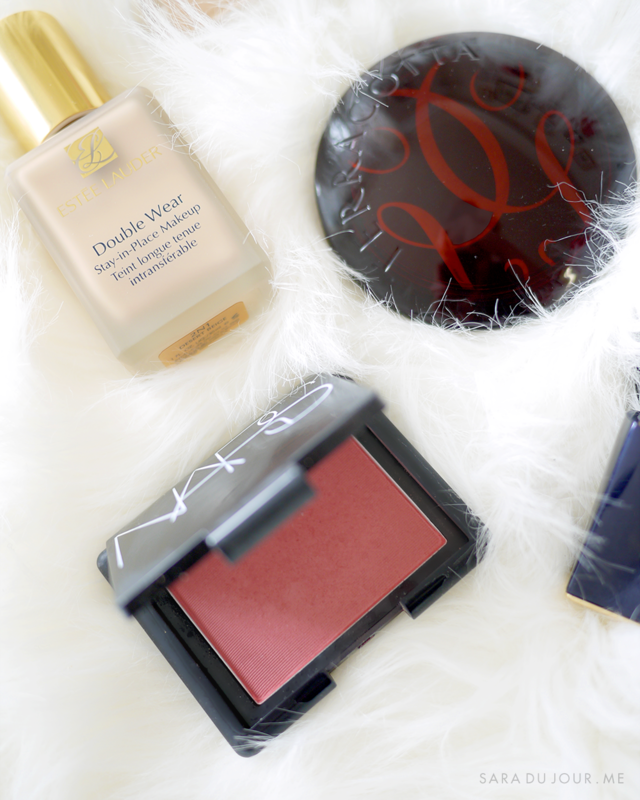 Some blushes tend to disappear throughout the day, but this one has incredible staying power. Because they’re so pigmented, you only need to touch your blush brush to the product to get enough colour, which means it’ll last you ages. 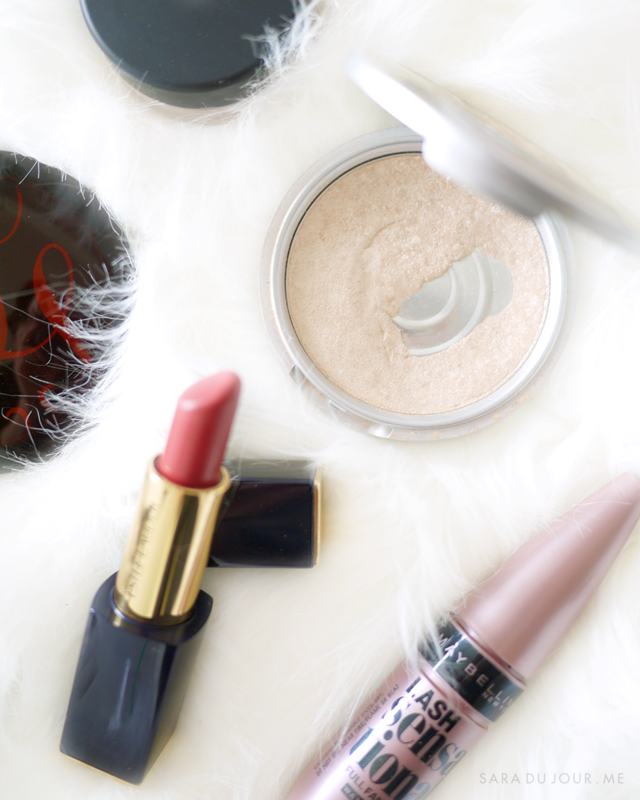 TheBalm’s Mary-Lou Manizer is a holy grail product in two categories for me. I use it both as a cheekbone highlight and as my everyday eye shadow on my lids. This sh*t is bananas. B-A-N-A-N-A-S. First of all, I’VE BEEN USING THIS SAME PRODUCT FOR FOUR YEARS. EVERY DAY. On my eyes and cheeks. For four years!!!! And there’s only a bit of pan showing. Do you realize how unbelievable that is? Aaaanyway, this stuff is great. It’s a beautiful shimmery champagne cheekbone highlight, but also the perfect brightening eyelid colour that helps me look more awake. And trust me, I need all the help I can get. Maybelline mascaras are all pretty amazing, it mostly depends on what kind of brush shape you prefer, and whether you like a dryer or more wet mascara formula. Lash Sensational is my personal favourite, due to the curved brush, and a formula that’s not too wet, but not too dry. 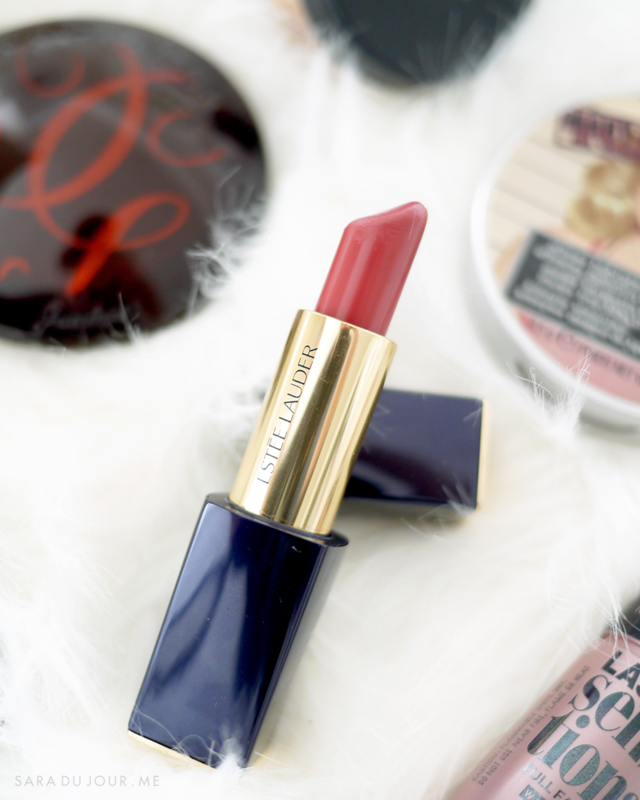 My everyday lip product is this Estée Lauder lipstick, in “Rebellious Rose”. It’s matte in the sense that there’s no shimmer in it, but it’s a moisturizing, creamy formula that feels comfortable on the lips and has a bit of a sheen. If you want it to look completely matte, you can just blot it on a tissue after applying, or blend a small amount into your lips with your fingertip for a natural-looking flush of colour. I love rose lip colours that look like my natural lip colour, but one or two shades darker. Also, the lipstick tube has a nice weight to it and makes me feel fancy. Last but not least is my Anastasia Brow Wiz, which is double ended to include a very fine, self-sharpening eyebrow pencil, and an eyebrow spoolie on the other end. You can do absolutely any brow shape you like with this, from more natural looking to more defined. It comes in a variety of shades for every hair colour, too.